AWF has learned that the Government of Tanzania is again considering a proposal to construct a road across the Serengeti, one of the most famous National Parks on Earth. By cutting through the northern part of the park, the proposed road would sever a critical corridor for the annual migration of hundreds of thousands of wildebeests and zebra, which has been rightly called one of the 'greatest spectacles on earth'. AWF believes such a road would negatively impact conservation, wildlife and human security, and park revenues. Most importantly, the road would mar a national and global asset in which the rule of nature still predominates and the footprint of human activities is hardly visible. Fully acknowledging the need to balance good conservation planning with economic development, AWF respectfully requests that the Government reject the road proposal, and offers alternative route recommendations that would achieve similar commercial goals without degrading this treasured National Park. The proposed road would link Arusha, with Musoma, cutting directly through a narrow section of the northern Serengeti. This would sever a critical wildlife route and have unacceptable environmental impacts on the Serengeti ecosystem. AWF supports the construction of a tar road linking Wasso in Loliondo Division, Ngorongoro District, with Mto was Mbu. However, as an alternative to dissecting the Serengeti ecosystem with an on-going tar highway, AWF recommends Tanzania link Mugumu, the capital of the Serengeti District, to the national and regional road network westward, towards Musoma and Lake Victoria, rather than linking them eastward toward Loliondo (see map). This would leave the northern Serengeti in its current pristine state. 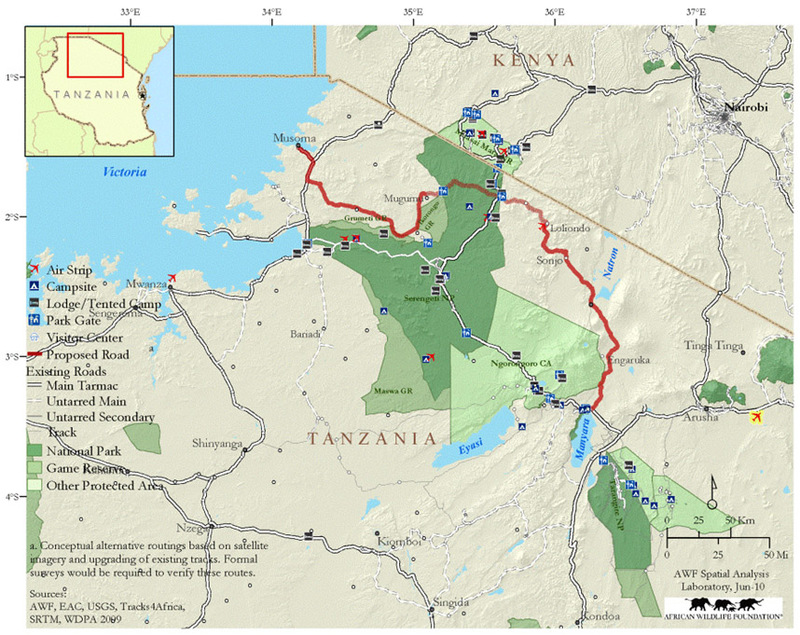 AWF further recommends that as Tanzania works to link the entire Lake Victoria region to areas further east, it consider building a road that passes to the south of the entire Serengeti/Ngorongoro conservation complex. AWF believes this alternative plan would have a positive impact on more people and minimize risk to the Serengeti ecosystem. In most countries around the world, poor planning and lack of vision and foresight have meant that significant wildlife populations have been lost to the forces of modernization. AWF firmly believes that with good planning, and a will to conserve, alternatives can be found that will meet human needs and aspirations while saving some of the most precious wild areas on the continent. Tanzania, perhaps more than any other country, still has the opportunity to get it right. An alternative road plan can help achieve a modern economy without compromising the most significant wildlife migration remaining on Earth.